People have real, important, and difficult questions when it comes to theology and the teachings of our faith. In this series of “Ask R.C.,” Dr. R.C. 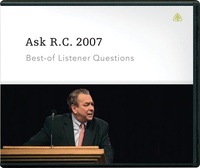 Sproul answers a variety of questions about the Bible, philosophy, the Christian life, and many other important theological issues called in by listeners and supporters of Ligonier Ministries.